Warren Buffett wants 90 percent of the cash his wife will inherit in the S&P 500 index; the remaining 10 percent in short-term bonds. I had a discussion the other day with a good financial planner. She is younger than I am (practically everyone is, these days), and handles risk differently than me. She invests by putting about 10 percent in cash or cash equivalents and 90 percent in aggressive funds. This reminds me of the current Warren Buffett wisdom—for his wife, according to this year’s letter to shareholders—he is suggesting that, at his death, 90 percent of the cash she will inherit be invested in an S&P 500 index (WB suggested Vanguard to the trustee) and the remaining 10 percent be in short-term government bonds. Mr. Buffett is not a fan of high fees, and, he clearly expects this mix to do well over time, and the fees should be negligible. I’m a great fan of Warren Buffett, as readers of the investment edge know; however, interestingly I think that his idea would drive my own customers nuts. In the main, my typical customers are between ages 60 and 92. They think they lose money when the market goes down, a kind of instant gut reaction—“bam,” the newscaster says, “the market took a big hit today and the market lost five percent.” Many of my customers immediately feel that they lost five percent or more. Of course, despite what the newscaster said, no one really lost a penny. The market simply declined, as it does about a third of the time. And his idea would not have worked well during the period from 1/1/2000 through 3/31/13. However, everything in this world is to scale, and Mrs. Buffett may have a bit more than my average customer and WB thinks in 50-year slices of time, a way in which my customers do not comprehend. I suspect in any 20-year period, the technique will do well, and probably in many rolling 10-year periods. Advisors like me tend to develop age-based portfolio ideas. When it comes to investing success, Warren Buffett has earned the right to be ageless, but most of my customers are not ageless, nor am I. If Mr. Buffett wanted to lower taxes instead of just worrying about expenses, he could invest in what I call a trading annuity. This approach would provide higher expenses, but tax control. 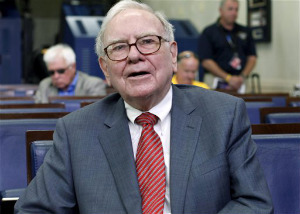 The government bonds and index could stay in the variable annuity and generate zero taxes during his lifetime, and then, afterwards, produce income for Mrs. Buffett that would provide an exclusion ratio for maybe 15-20 years, thus escaping a large amount of tax. A variation of Mr. Buffett’s 90/10 idea is the three-bucket approach recently espoused in my daily e-mail update from morningstar.com. I kind of like this approach, which puts cash and equivalents into one bucket, moderate investments into a second and fairly aggressive plays into a third. I write this on a drizzling, cold Oklahoma day. We sprang ahead over the weekend; now, maybe the sun will shine and spring will show some oomph. Have a wonderful week and look for green shoots.